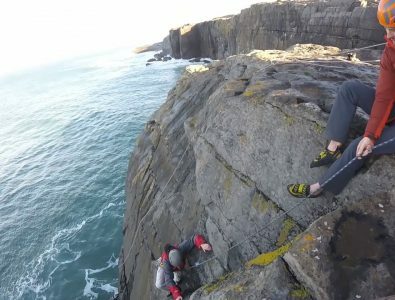 Sea cliff climbing is one of the most unique and adventurous disciplines of rock climbing that you can try and the sea cliffs in The Burren are undisputed as being the best in Ireland. Imagine the feeling as you abseil down to a ledge, literally metres above the waves of the wild Atlantic ocean itself, with no other option but to climb upwards. Its a truly unique adventure and will have your heart pumping from start to finish. Rock Climbing experience is not essential but if you do have climbing experience and want to take on some of the more advanced climbing routes, our guide, Brian, can talk you through your options. – For beginners – an introduction to Climbing, with a build-up to a Sea Cliff Climb. All equipment supplied and training by qualified MIA mountaineering instructor Brian Bateson of Climbit.ie with private tuition for one to four persons. Due to the small size of groups and limited space, confirmation with the activity provider will be required and will be conducted within 7 days of booking. Price is based on up to 2 persons sharing. Additional persons sharing a room will cost an extra €45pp including activity, food, and beverage. Additional persons up to a maximum of 6 per group, if booking additional rooms book standard rooms and note additional participants. In the event that the activity cannot be conducted a refund for the activity will be given. Transport too activity not provided. There is a two week cancellation policy for this package. TIP! During your stay, enjoy the local area, hike the Cliffs of Moher Coastal Trail, visit Doolin Cave and relax to some great tunes in the local Doolin pubs every night.